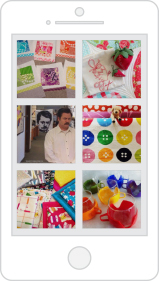 I wasn’t able to go to Fall Quilt Market, but little bits and pieces of me where there. And thanks to Pam and her trusty Sidekick and E and her iPhone and their text messages… and Cyndi and her media message… I felt almost like I was there. 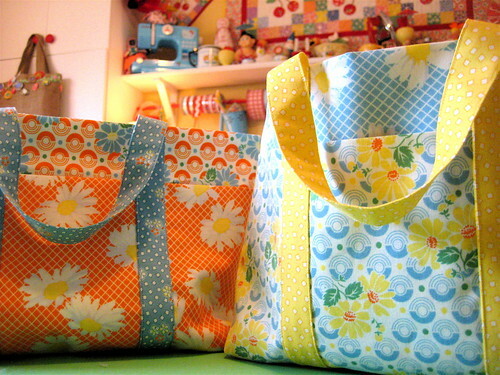 I showed a peek of the darling DARLING Minny Muu by Lecien fabric here, and at Market it was revealed what I was up to. 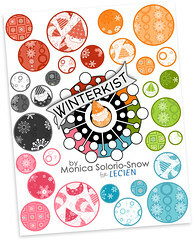 I designed/made a free quilt pattern for Lecien - which debuted at Market. 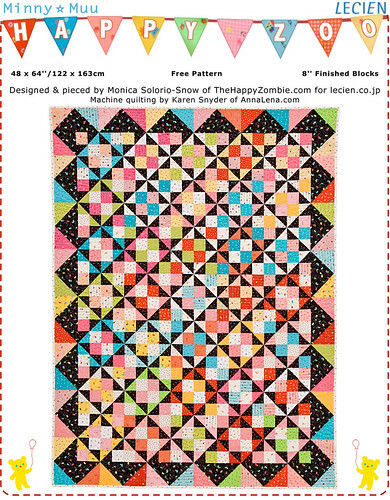 The Minny Muu Happy Zoo free pattern is available at Lecien’s website here. 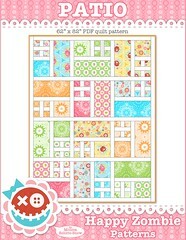 I had such fun making this quilt - the Minny Muu is just too stinkin’ cute… how could it not be fun. 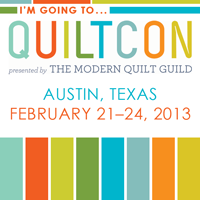 My very talented friend Karen did the beautiful machine quilting and C&T Publishing did the killer photography. Happy Zoo is hittin’ the road visiting quilt shops to promote the line, so give it a hug for me if you see it. MMHZ is currently visiting Uncle Joe and Auntie Roxie at Thimble Creek, no doubt being pampered and spoiled! Also at Market were two of my pocket purses (from my pattern here), showcasing Karen’s fabulous FABULOUS new line with Timeless Treasures. Nerve-wracking for me to make these - since I made them from strike-offs. One boo-boo and I would have been sailing up S-creek without a paddle. Not like I can just run out and get more. I’m still oohing and ahhing over Karen’s new line. The colors are so crisp and happy. Can’t wait to see it in stores. I can’t wait to read al the posts about Market. I was able to read a few already, saw a few pics here and there… such fun to read - and sooooooo missed not being able to see everyone. that quilt is fantastic!! Hopefully I will be there next year with my new line of fabrics, well shall soon see! Anyway I got a call from my best friend Nicole who lives in Denver, she was on her way an hour ago to vote for Obama!!! I was sooo jealous we do not have early voting here in MA. She told me the lines were 1hr 15 min long to vote!!! GOOOOO Obama!! Yippie!!!!! Can you tell I’m excited and I cannot wait to see his 1/2 hour special tonight!! 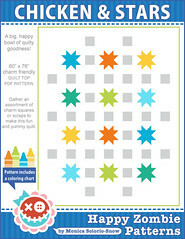 The quilt pattern is wondeful! I love it. I just love those bags, too. I have, HAVE to make one. Soon. Love that quilt!! And thank you for sharing the Obama blog-bling! Yes, I really would have loved it if you would have been at market, boo hoo! I did however see your Happy Zoo quilt up close and personal in the Lecien booth. So it was sort of like having you there, well not really. 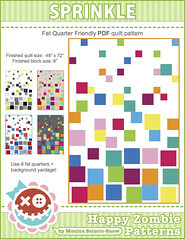 I loved the quilt so much and will download the pattern and add to my list of to dos. I did get to meet PKM and E!! Fun! I just posted some pics from market and will be posting a series, so check it out!! Lovelove the your quilt! Thanks for sharing. The bags are fabulous. 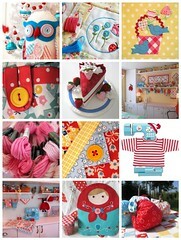 I can’t wait to get a hold of Karen’s new fab fabrics. Is it out? Is it out? Is it out? Well you were certainly well represented even if you didn’t go. Love the quilt and the bags. What great people/fabrics to be making things for. I saw the quilt! I brought home the pattern! I had no idea it was yours but I should have realized it. Duh. Gave Patty a big hug (or 10) and Candy, Maureen and Lulu had a little bit of hang time. You were missed, though. Wow, that quilt is adorable, I really love it! Once again, you have a hit!! Great job! The bags are even more adorable in person. Too bad I didn’t get a photo of the aprons that I made from K’s new line for TT…they turned out really cute, too. You are soooo talented my friend….! I look forward to Sat!! Wow ~ I love that quilt! The fabrics are so fun. 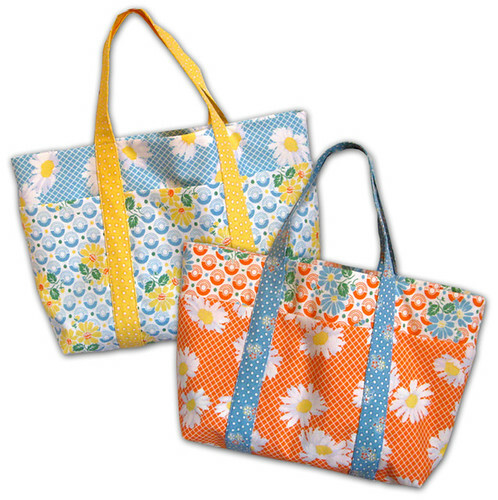 Having seen those sweet bags in real life, I must say that they are gorgeous as well. Karen’s new line will be in stores when? Sorry you had to miss out on this one and couldn’t be with your peeps for real, but sounds like the texts were flying! OH I just want to print this out and post it prominently so I can smile happily every time I walk by. 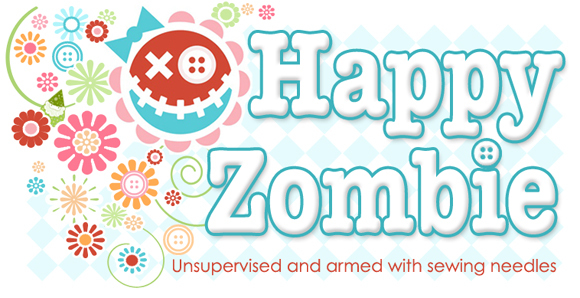 SO crisp and cheery and CUTE! I adore it Monica. Just fabulous!!! I just love the fabric, the colors are perfect! What wonderful friends to keep you posted so you didn’t miss out. The bags look fabulous! I love that quilt. I love the contrast of the black triangles. It is just gorgeous! Those bags are cute too. Monica, that is one bea-u-ti-ful quilt! Amazing. I love how you have the fabrics working together. It boggles my mind how you can take a stack of fabrics and come up with such a gorgeous piece. I need someone to tell me exactly what to do! Hey you don’t have to go to Market to enjoy seeing cool stuff and your blog proves it! 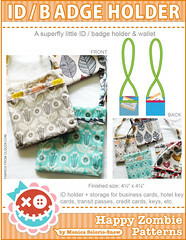 That quilt is creative, inspirational and fantastic and the purses are great! Thanks for always providing great stuff to look and happy posts. 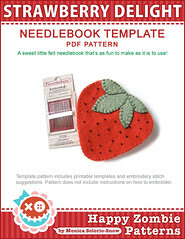 Such a cute pocket purse pattern! I love those fresh colors. Love the quilt too. YOU McGO GIRL. Wow- the quilt. Wow-the fabric. Wow- the bags. Wow- Happy Zoo…how cute is that name???? Super cute, that Happy Zoo is! We missed you lots! Karens fabrics are beautiful. I love the daisy’s. Those things I can drool over and eventually make. Barns and barn cottages I just have to drool, for the time being. It has been fun to live vicariously through the other bloggers that went to Market. Missed seeing you at Market! Your pattern is so cute. And, I need one of those bags to hold all my purchases. I’m so sorry, I think I got a bit of drool on your quilt ;) I kept coming back to admire it, it’s so lovely in person and the Minny Miu fabrics are DARLING!!!! I do believe you NEED one of my “fabric ADDICT” pins…would have given you one if I had seen you there, but if you send me your address, I’ll happily ship it off, you talented girl you!!! I visited your quilt at Market. It looked smashing in the Leicen booth. It was a REAL pop of color there. You did yourself proud–and me, too! 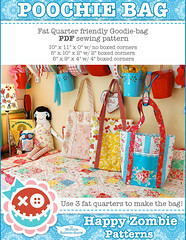 I love the quilt and the pocket purse(s)! Good job!!! I visited your quilt several times….how could I not? It is just so stinkin’ happy! WOW!! It is a small world!! Your quilt is GREAT!! I have a friend who lives near Thimble Creek…I will have to give her a heads up to go and see visit it and give it a hug for you!! Love the bags!! The bags are very cute!! Lovely. I posted a ISBN about a french book on purses and bags. I think that it would interest you very much. There’s a quilted one which is very nice but my favorite is the felted one! Your work is ver nice. Oh my! I was at market, and I was loving your quilt. I’m so glad I did the blog round tonight to learn that it was yours. I saw that line of Minny Muu fabric a few months ago, and when I saw it all quilted up, I fell in love with all those cute tiny prints all over again. Thanks for your work on the pattern. I am planning to post a link to it on my own blog. Now I can give proper credit! I love the purses, a lady I know made me one, then I seen it was your design. awesome..